The Victorian Inn’s Special Event Room accommodates your group gathering, elopements, retreats, conferences, or meetings for your family or organization. This very private and ‘away from the crowd’ room will accommodate up to 40 people. Up to 125 guests can be accommodated in this much larger space for gatherings of families, quilter’s retreats (we currently do two full weekends of these every year), dinners, receptions, etc. It’s very private and away from everything else in the Inn. Let’s talk about what your ideas are for it! The Event Room and the Banquet Room can be set up for any group event or special occasion and has available tables, PA system, free wireless internet access, a podium for your speaker and can be arranged to meet your needs. If needed, we can provide a bar and bartender for your event. 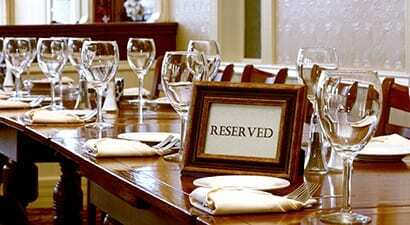 The VI Restaurant can provide any catering needs for your group’s enjoyment. Victorian Inn, VI Restaurant and Tavern have everything you require for a perfect business or social get together. Whether you’re planning a Family get-together, business retreat or a quilting weekend, the Victorian Inn and VI Restaurant will make your group’s experience successful and memorable. Contact us today for more information and to make reservations.